about Baird’s Associate Resource Groups. At Baird we know our people, and specifically their passion for all they do, make us unique in our industry and a great place to work. The energy, experience and ideas that make them who they are is incredibly valuable to us. Which is why our Associate Resource Groups (ARGs) were created. Learn how our Associate Resource Groups not only provide development, networking and leadership opportunities – they help us recruit outstanding professionals to join Baird. As the video below explains, Baird’s Associate Resource Groups (ARGs) provide support for shared interests and beliefs as well as professional development, networking and leadership opportunities. The members of these groups demonstrate daily that the best outcomes result when people with different backgrounds and perspectives work together toward common goals with mutual respect. In addition to creating a supportive and inclusive environment for Baird associates, the ARGs are helping the firm better understand its future clients. As the video below explains, driving inclusion and diversity across Baird makes a meaningful impact on our business and in our clients’ lives. ASCEND shares a common vision of making Baird the employer of choice for women in the financial services industry. Through recurring professional development sessions, small networking groups and the biennial “Women at Baird” event, Ascend continues to expand leadership opportunities for women, promote their voices and perspectives inside and outside of the firm, and help retain the best females in the industry. BAIRD GIVES BACK continues the firm’s proud tradition of giving back to our communities by collectively contributing thousands of hours in volunteer time each year to a multitude of global nonprofit organizations. The group’s most visible activities occur in May during Baird Gives Back Week, a week of collaborative volunteer opportunities planned entirely by associates. Family members and friends join associates to perform community service, aid the less fortunate, and support arts and education. ECO helps create and improve environmentally sustainable practices at work, at home and in the community. ECO’s educational efforts throughout the year include lunch-and-learn sessions, an annual Earth Day celebration, and sharing tools and resources to help support ongoing sustainability efforts. Members encourage associates around the world to help reduce waste by using recycled products, minimizing paper usage and encouraging our clients to receive paperless statements. PATRIOT supports members of the U.S. military, veterans and their families. In addition to offering assistance to current and former members of the armed forces, the group focuses on recruiting and retention – making Baird the employer of choice for veterans. PATRIOT hosts regular events and encourages associates to get involved in the community throughout the year. PRISM provides associates of underrepresented ethnicities with support, resources and opportunities for professional growth and development. 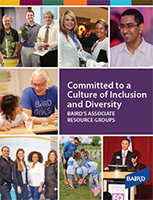 The group increases associates’ exposure to opportunities across Baird and helps facilitate a more inclusive environment that recognizes the value of diverse thoughts, backgrounds and perspectives. Prism hosts a number of professional development opportunities and events to connect with senior leaders and enhances Baird’s diverse recruiting efforts. PULSE explores the needs and trends of Baird’s next-gen associates through the promotion and engagement of firm and community opportunities. The group creates a platform for associates to collaborate and build connections with peers and leaders. PULSE further supports the fi rm’s retention eff orts by providing opportunities for networking, information sharing and skill building. SPECTRUM is Baird’s lesbian, gay, bisexual and transgender group, which works to establish inclusive firm policies and procedures to cultivate an open and authentic work environment. The group provides support and networking opportunities for associates and promotes activities that raise awareness of LGBT+ communities. Spectrum members explore and advise on new approaches to attract and retain top talent and work across the firm to foster open and informed relationships to better serve our diverse clients and communities.